Denise: I felt insecure because my skin was sagging and flabby. I wore Spanx every day, even if it was just to go to the supermarket. It affected my marriage and my friendships because I wasn’t myself anymore. I still had a mom body… skinny legs and arms with a kangaroo belly pouch. I knew I had to step up my game by strength training with Body Beast if I truly wanted to change my physique. It was my idea to start. I purchased the program in 2014 and did one complete round by myself before I forced him to join me. He was suffering from back problems after years of running, and I got tired of watching him feel sorry for himself. I told him, “You need this in your life,” and thankfully, he trusted me enough to give it a shot. David: We set a goal and wrote it down; it was to win the Beachbody Classic. Then we did Body Beast together on the same schedule so we always knew where we were on a daily basis. This helped us to stay focused and motivated. We woke up with a plan, did the workouts, and it was good because we did not let each other slack off. Denise: Dave and I knew that if we were going to do this, we had to do it right, starting with waking up at 4:30 AM each morning to work out together so the kids had us both available when they got home from school. 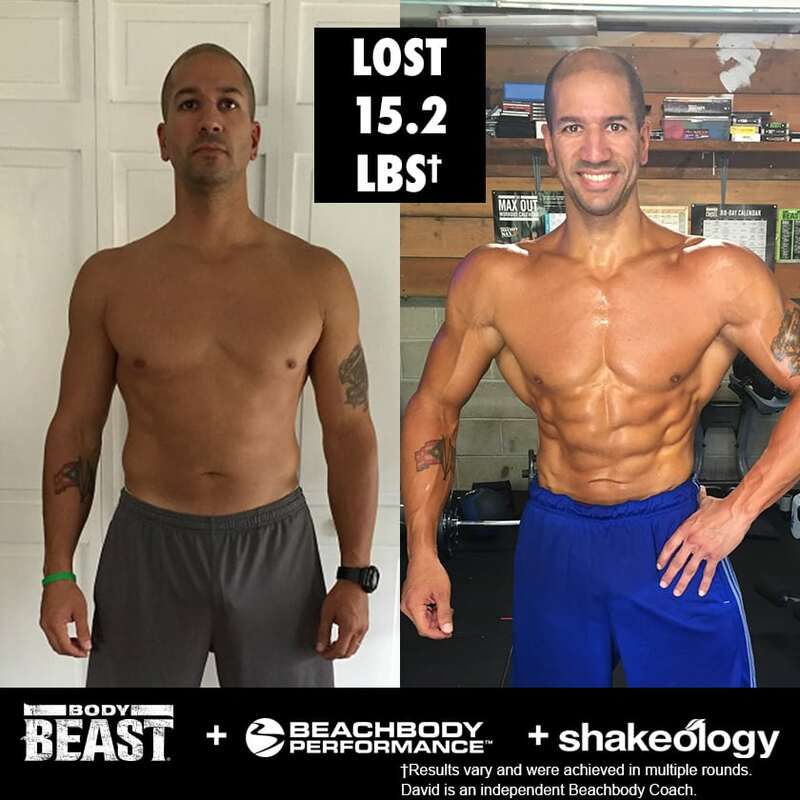 Following the Body Beast calendar, nutrition guide, and Sagi’s competition prep was vital. No matter what got in the way — birthday parties, family BBQs, holidays — it didn’t matter, he was there right by my side going through it right along with me and I love my husband more today than ever before. David: I couldn’t believe how much my body changed in such a short amount of time. It was the first time I ate for the gains and I followed the meal plan as closely as possible. I started to feel strong and I was filling out my clothes better. I was so proud of Denise because she impressed me with how she was able to go heavier with her lifts and do more push-ups. David: To go through this process of working out, eating right, and preparing for the competition alone would be very difficult. Doing it all together helped because we went through the same struggles together. We knew how the other was feeling when we had to cut carbs and do extra cardio and drink gallons of water and apply the self-tanning oils and practice posing routines. It was also important that we were real with each other. It’s helpful when your spouse tells you what you need to hear as opposed to what you want to hear. 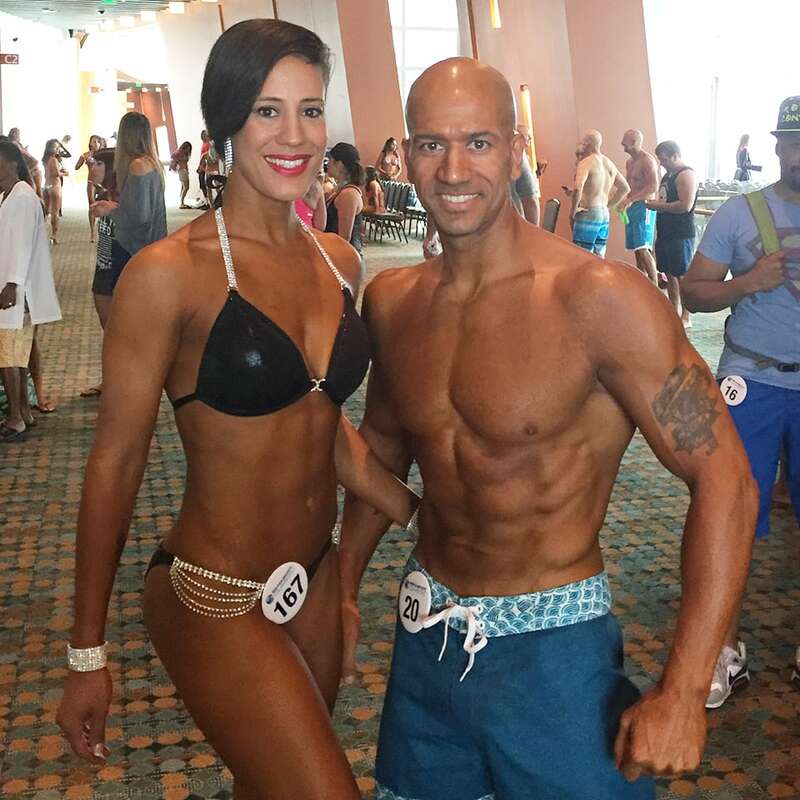 Denise helped me make the corrections I needed in my diet and posing to become better. Denise: Knowing that he’s right there to give me those words of encouragement when I feel like giving up is the reason I’ve been able to get this far in my fitness level. David: The best part of the Classic last year was being able to walk on stage together holding hands. Walking through the tunnel up to the stage I thought about all those workouts, all that sweat and struggle. I thought about all those meals we prepped together and endless hours of practicing; then to walk out on stage together and show the crowd how we accomplished getting into the best shape of our lives was a truly amazing moment for me. David: I feel it helped us to communicate better and become a stronger team. Since we were on the same path, we made a pact to get the kids ready in the morning together. While one parent made the breakfast and got the snacks together, the other was brushing hair and getting them dressed. This helped us to be more efficient with our time and allowed us to get more done. We also ate a lot of the same meals, of course in different portions, but it helped us take the guesswork out of what to eat every day. Denise: Doing Body Beast together has brought us so much closer. We cook and plan meals together, talk about our goals, and since I’ve gained so much confidence… the intimacy has never been better. Denise: In this day and age where everything is processed and no one pays attention to serving sizes, we take pride in knowing that our children see mommy and daddy exercising at home and cooking healthy meals every single day. Our hope is that this lifestyle becomes normal and the kids can say “it’s just what we do,” because I have to admit, I didn’t see that growing up and it took a lot of effort for me to get to this point. David: I would encourage other couples to work out together. There is an experience that happens during the workouts that is almost indescribable. When you workout alone, you may allow yourself to cheat on a rep or two, or take extra breaks. When you workout with your spouse and you set a goal together, you don’t let the other slow down, or take that break, or cheat on a rep. This is the one occasion where you don’t get in trouble for yelling at your spouse. (“Come on! You got this! Keep going! I don’t stop, so you don’t stop!”) You push one another to the max and the bond that is created through that process is better than any weekend getaway or vacation! When as a couple, you can unite on a common goal and organize your life around accomplishing that goal, you realize so many things about yourself and your relationship. You start to see how creating those habits of planning the workouts, the meals, and going through the pains and struggles together forces you to rely on each other for support. It has created a special bond for us, a story that we can be proud to tell and continue to write every day. Denise: We’re preparing for our second trip to the Classic stage as we speak. And guess what our go to program is? That’s right — Body Beast! I cannot stress enough how Body Beast has improved my marriage. It came into our lives when we needed it the most. It not only helped us improve our physical appearance, it showed us how to get through difficult times by pushing our limitations and cheering each other on. A lot of married couples tend to forget about each other, especially after having children. Working out together is something I encourage every couple to do. There’s a new bonding experience and shortly thereafter, the intimacy improves because they’re experiencing something together. Congratulations to Dave and Denise for setting a goal together, working toward it together, and then standing on stage and competing together! If you’ve got the workout-buddy-bug and want some tips on how to best work out with your partner, check out these five tips by Todd and Michelle, who also completed Body Beast together.